This shape is without a doubt the most popular among modern carp fishermen, ensures good casting ability while minimizing tangles and prevents the weight from rolling on slopes. This is a true all round shape. Gripper Leads hold onto almost any kind of bottom and because of the flat shape they also won't roll easily. Preferred by anglers who fish at extreme distances because of the added grip to ensure that line drag doesn't affect the rig. The flat shape and excellent gripping ability increase the bolt effect to ensure more positive hook-ups. Tri-bomb leads are specially designed for distance casting. 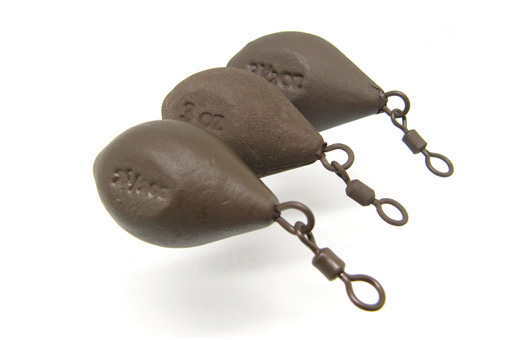 The shape puts the centre of gravity at the bottom of the weight to ensure excellent balance for long distance casts. 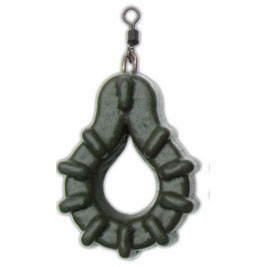 The lead is flattened on three of the sides to prevent the lead from rolling on sloped bottoms, and this also aids in setting the hook on a bolt rig. For when you need an absolutely rock solid lead arrangement. Designed for fishing at extreme ranges, specialist anglers fishing on the rivers or lakes with a strong undertow.